Âdam or Aadam (Arabic: آدم‎, translit. ʾĀdam) is believed to have been the first human and nabi (Arabic: نَـبِي‎, prophet) on Earth, in Islam. Adam's role as the father of the human race is looked upon by Muslims with reverence. Muslims also refer to his wife, Hawa (Arabic: حَـواء‎, Eve), as the "mother of mankind". 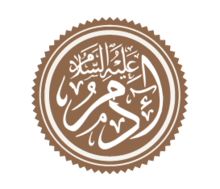 Muslims see Adam as the first Muslim, as the Quran states that all the Prophets preached the same faith of Islam (Arabic: إِسـلام‎, 'Submission' (to God)). In the Qur'an Adam is given the name by God known as the (Adam-I-Safi) or The Chosen One. The name Adam written in Islamic calligraphy followed by Peace be upon him. Synthesizing the Quran with hadith and Islamic exegesis can produce the following account. Before Allah created Adam, He ordered the archangels to bring seven handful of soil from the earth, in different colours, hence the different skin colours. But the earth sought refuge of God, thus the earth will not be distorted. Only Azrail succeeds, due to seeking refuge of God, for he will not return with empty hands like the other archangels before. Azrail took dust from different parts of earth, therefore his children may have different skin colours. Hadith add that he was named Adam after the clay he was made out of, or the skin (dim)of the earth. Returning to the Qu'ran, when God informed the angels that he was going to put a successor on Earth, they questioned whether the human would cause bloodshed and damage, but he told them that he knew what they did not and taught Adam the names and commanded him to call them. When the angels failed to call the names Adam knew, they all obeyed to prostrate, except Iblis. He said, "I am made from fire when Adam is from clay. I am better than him. I am not going to prostrate before him." He created Adam from clay and breathed life into him. A widely accepted, yet not based on the Qur'an, narration in Islamic literature says, that while Adam was sleeping, God took a rib from him and from it he created Eve; however, the exact method of creation is not specified. The Qur'an then says that God commanded that Adam and Eve not approach (come closer to) the one tree in the garden of Eden, but Iblis was able to convince them to do that. They then began to cover themselves because they now knew that they were naked. For this God banished Adam and Eve to earth; non-canonical Sunni hadith say that fruits were turned to thorns and pregnancy became dangerous. Non-canonical Sunni hadith also say that Adam and Eve were cast down far apart, so that they had to search for each other and eventually met each other at Mount Arafat. In Islamic theology, it is not believed that Adam's sin is carried by all of his children. Hadith say that once Adam was on earth, God taught him how to plant seeds and bake bread. This was to become the way of all of Adam's children. Adam proceeded to live for about 1000 years, though this has been a topic of debate. Adam may be seen as an archetype of humanity or as a symbol for the emerge of humankind. According to the Islamic narrative of Adam, humankind has learnt everything from Adam. He was the first to learn to plant, harvest, and bake as well as the first to be told how to repent and how to properly bury someone. God also revealed the various food restrictions and the alphabet to Adam. He was made the first prophet and he was taught 21 scrolls and was able to write them himself. Adam was also created from the earth. It is well known that earth produces crops, supports animals, and provides shelter, among many other things. Earth is very important to humankind, so being created from it makes them very distinct. According to some Hadith, the various races of people are even due to the different colours of soil used in creating Adam. The soil also contributed to the idea that there are good people and bad people and everything in between in the world. Adam is an important figure in many other religions besides Islam. The story of Adam varies slightly across religions, but manages to maintain a general theme and structure. Though it is up for debate, it has been said that Eve went through 20 pregnancies with Adam, each of the births consisted of a set of twins: a boy and a girl, in other narrations it has been said that Eve went through 120 pregnancies, each was also a set of twins. In Shia traditions, their first child was a girl, born alone, called ʿAnāq. According to several sources, God took all of Adam's progeny from his back while they were still in heaven. He asked each of them "am I not your lord?" as read in Q 7:172 and they all replied yes. For this reason, it is believed that all humans are born with an innate knowledge of God. The most famous of Adam's children are Cain and Abel. Both the brothers were asked to offer up individual sacrifices to God. God accepted Abel's sacrifice because of Abel's righteousness and Cain, out of jealousy, threw a rock at Abel, leading to the first murder in human history: the murder of Abel by Cain. As Adam grieved his son, he would preach to his children about God and faith in Him. When Adam's death drew near, he appointed his son Seth as his successor. The story of Adam and creation is pieced throughout the Quran. There are references in suras 2, 4, 5, 7, 15, 20, 21, 38 and others. According to the Quran, God created humankind out of clay, shaped it to a form and then commanded the angels to bow (submit) to Adam. Iblis (Devil) refused out of pride and was banished from Jannah (Paradise). According to the Quran, God had already decided before the creation of Adam that mankind (Adam and his progeny) would be placed on earth. Islam does not describe mankind's life on earth as a punishment, rather as part of God's plan. "'Verily, I am going to place mankind generations after generations on earth.' They (the angels) said: 'Will You place therein those who will make mischief therein and shed blood, while we (the angels) glorify You with praises and thanks and sanctify You?' God said: 'I know that which you do not know.'" "And He taught Adam the names - all of them. Then He showed them to the angels and said, "Inform Me of the names of these, if you are truthful." They said: "Glory to Thee (said the angels), of knowledge We have none, save what Thou Hast taught us: In truth, it is Thou Who art perfect in knowledge and wisdom." He said: "O Adam! Tell them their names." When he had told them, God said (to the angels): "Did I not tell you that I know the secrets of heaven and earth, and I know what to reveal and what to conceal?" "We said: "O Adam! dwell thou and thy wife in the Garden, and eat of the bountiful things therein as (where and when) ye will; but approach not this tree, or ye run into harm and transgression." "Then did Satan make them slip from the (garden), and get them out of the state (of felicity) in which they had been. We said: "Get ye down, all (ye people), with some of you having enmity towards others. On earth will be your dwelling-place and your means of livelihood - for a time." "Then learnt Adam from his Lord words of inspiration, and his Lord Turned towards him; for He is Oft-Returning, Most Merciful." "We said: "Get down all of you from this place (the garden), then whenever there comes to you Guidance from Me, and whoever follows My Guidance, there shall be no fear on them, nor shall they grieve." In the Garden of Eden, Satan (often identified as Iblis) lures Adam and Eve into disobeying God by tasting the fruit from the forbidden tree. God, sends Adam and Eve out into the rest of the earth. The Quran also describes the two sons of Adam and Eve, Cain and Abel. ^ Lalljee, compiled by Yousuf N. (1981). Know your Islam (3rd ed.). New York: Taknike Tarsile Quran. p. 71. ISBN 978-0-940368-02-6. ^ Concise Encyclopedia of Islam, C. Glasse, Aadam = Adam = Man = Mankind = Early humans. His wife = Woman = Allegorically, early women. Udma = Ability to live together as a community. Aadam from Udma thus, indicates humankind. The word 'Eve' or 'Hawwa' is not mentioned in the Quran. She is described with dignity as Mer’a-til-Aadam = Wife of Adam = Mrs. Adam. ^ a b c Wheeler, Brannon M. (2001). Introduction to the Quran : stories of the prophets. New York: Continuum. ISBN 978-0-8264-4957-3. ^ a b Thorp, John (1982). "The Muslim Farmers of Bangladesh and God's Creation of the World". Asian Folklore Studies. 41 (2): 202–203. doi:10.2307/1178123. JSTOR 1178123. ^ Phipps, William (1996). Muhammad and Jesus. New York: The Continuum Publishing Company. pp. 122–3. ISBN 978-0-8264-0914-0. ^ a b c d e f g al-Tabari (1989). The History of al-Tabari. New York: State University of New York Press. p. 259. ISBN 978-0-88706-562-0. ^ a b c Kathir, Al-Imam ibn (2013). Stories of the Prophets. Fortress iPublications. ISBN 978-1-4848-4091-7. ^ a b Michael E. Stone, ed. (1998). Biblical figures outside the Bible. Harrisburg, Pa.: Trinity Press Internat. ISBN 978-1-56338-247-5. ^ Roberto Tottoli, “ʿAnāq”, in Encyclopaedia of Islam, THREE, ed. by Kate Fleet and others (first published online 2009), <https://dx.doi.org/10.1163/1573-3912_ei3_COM_22679>. Saad Assel, Mary (2010). 25 Icons of Peace in the Qur'an: Lessons of Harmony. iUniverse. p. 244. ISBN 978-1-4401-6901-4. Mehar, Iftikhar Ahmed (2003). Al-Islam: Inception to Conclusion. AL-ISLAM. p. 240. ISBN 978-1-4107-3272-9.